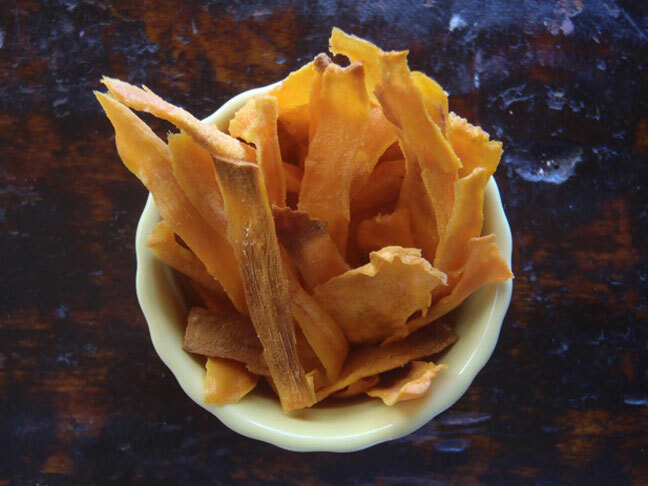 These yam chips are deliciously sweet and crisp. Watch out—you might not be able to stop munching on them! These chips are a healthy snack and can also be a fantastic side dish with lunch or dinner. I throw some in a container and add them to my boys’ lunch boxes! Yum! Watch out---you might not be able to stop munching on them! Step 1: Preheat the oven to 400 degrees and line a baking sheet with foil. Step 2: Use a vegetable peeler to remove the skins from the yams and then discard them. 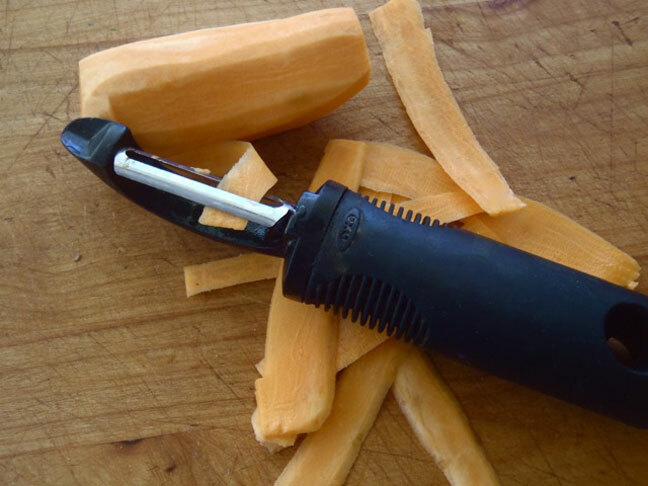 Continue using the vegetable peeler to turn each yam into "peels." They will all vary in shape but should all be about the same thickness. Step 3: Spread the "yam peels" onto the foil-covered baking sheet. Drizzle them with olive oil, sprinkle with salt, and toss them to coat them evenly. Step 4: Then spread them on the foil and bake until they begin to firm up, about 6 minutes. (Some will begin to brown, and that's okay, but don't let them get too dark or they will become bitter.) The yam chips will continue to harden out of the oven. Step 5: Gently remove them from the foil and eat! Sprinkle with more salt to taste. An additional note: This will serve about four as a side, but you'll likely want to double the recipe for future snacking!